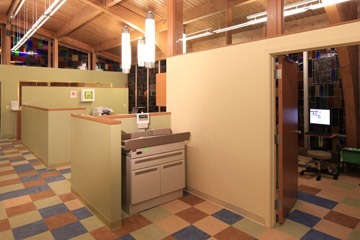 The Lawndale Christian Health Center Archer Avenue project was an adaptive reuse renovation of an existing church and pastor residence that was converted into a community health center. 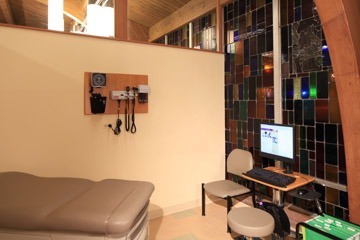 The space is operated by Lawndale Christian Health Centers, a non-for-profit Christian-based organization that provides accessible and affordable primary health care, dental care, and preventive educational support services to the local community. Madison Construction performed preconstruction services and construction services on the project. Though the facility is not LEED accredited, it is making use of sustainable design concepts and materials. Innovative roof insulation systems, thermally efficient windows, sustainable interior finish materials, and use of passive solar design principals are a few of the specific green design concepts included. Particular attention has been paid to two building aspects: maintaining the vaulted heavy timber framing look of the building, as well as maintaining the feel of the existing sanctuary and ornate stained glass.